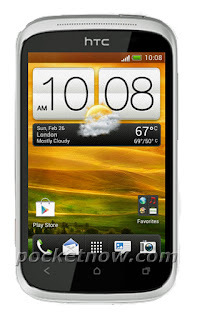 A press image of HTC's upcoming entry level Android 4.0 ICS smartphone codenamed HTC Golf has leak out. According to pocketnow, HTC Golf will be called as HTC Wildfire C, the successor of the HTC Wildfire and Wildfire S budget smartphones when launched and is positioned below the HTC One series. The HTC Golf is rumored to come with a single-core CPU with a clock speed below 1GHz, 3.5-inch HVGA (480x320) display, 512MB of RAM, 4GB of internal storage, microSD card slot, 25GB of free Dropbox cloud storage for 2 years, Bluetooth 3.0, Wi-Fi 802.11 b/g/n, Beats Audio software enhancement and a 5 megapixel camera. The phone is expected to launch before the end of this quarter with an affordable price. Visit my tech blog: http://hitech24.blogspot.com Do not forget to subscribe to our feed via email or via rss and you may be the winner of uor special prize. A sony xperia s smartphone!